A former delegate to the United Nations General Assembly (UNGA) has assailed Vice President Leni Robredo for “misrepresenting” millions of Filipinos when she addressed the 60th annual meeting of the UN Commission on Narcotic Drugs via a video message that highlights alleged rights abuses in President Rodrigo Duterte’s so-called war on drugs. “I am making this urgent appeal on behalf of each and every Filipino grossly misrepresented by our Vice President in the said video message, in reporting to the world what she failed to report to Philippine authorities,” said Michael Francis Acebedo Lopez, a Filipino and a former delegate to the UNGA. 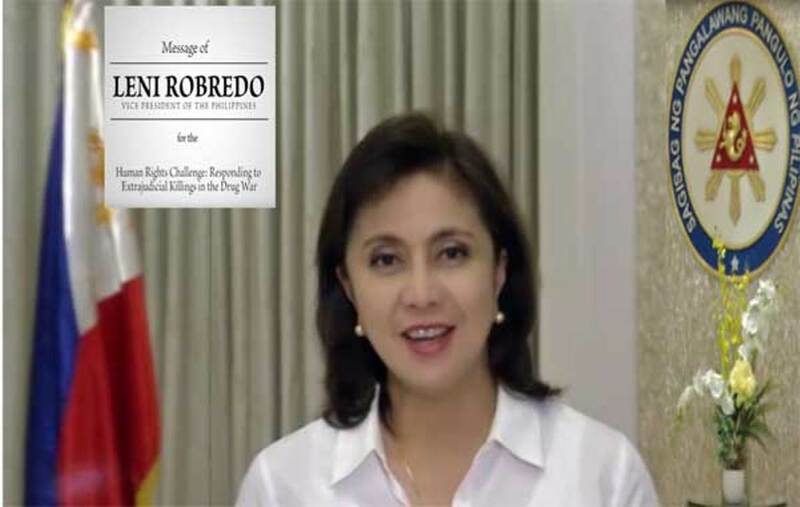 Lopez noted that Vice President Robredo, whose own mandate has been called into question, with the country’s highest electoral tribunal considering the election protest against her win to be sufficient in both form and substance, “wantonly painted an impossibly grim image of the Philippine situation if only to attract international attention and action with unfounded claims and unsubstantiated allegations”. Assuming there are actual reports received by the Office of the Vice President, Lopez said Robredo “has not only embarrassed our country, she has betrayed the public trust and committed economic sabotage, both punishable under Philippine laws”. In the video, Robredo references the more than 7,000 people killed since the drug war began on July 1, 2016. The death toll has reportedly increased to 8,000. “Our people have fought long for our rights and freedoms. We are not about to back down now,” she said. Robredo also details in her video message other supposed human rights abuses occurring under the present administration — people beaten for requesting search warrants, and police detaining relatives in lieu of absconded drug suspects. She also questions inconsistent figures on drug addiction reported by President Duterte. Rather than a problem to be solved with bullets, Robredo said drug abuse “must be regarded as it truly is — a complex public health issue linked intimately with poverty and social inequality”. In reporting to the world what the Vice President failed to report to Philippine authorities, Lopez said she “has not only embarrassed our country, she has betrayed the public trust and committed economic sabotage, both punishable under Philippine laws”. “When the Vice President says 7,000 people have been killed in the President’s war on drugs, she fails to mention that this is set against the backdrop of around 700,000 to one million successful arrests and surrenders. So the figure she presents to you is not even 1 percent. And surely with the sheer number of those involved in the illicit drug trade, some police operations see suspects resisting arrest and fighting back and the police having to defend themselves resulting in casualties,” he noted. “Any effort to disturb our democracy and sovereignty as a response to the Vice President’s irresponsible and unfounded claims will subvert the will of the Filipino people and violate our Human Right of Suffrage enshrined in both the Philippine Constitution and the Universal Declaration of Human Rights (Article 21 of the international covenant),” he stressed. Lopez reiterated his appeal to members of the UN Body “to disregard the Philippine Vice President’s statement which is, I reiterate, a grave misrepresentation of the prevailing sentiments of our people and a gross perversion of the facts surrounding the war on drugs”.